NETWORK FINALS: After adjustment for the PGA Championship overrun, 60 MINUTES fell 0.3 and BIG BROTHER gained 0.3. In addition, the TEEN CHOICE AWARDS lost 0.1, the rerun of THE SIMPSONS dropped 0.3, the rerun of BOB’S BURGERS was down 0.2, and the rerun of AMERICA’S FUNNIEST HOME VIDEOS lost 0.1 in final numbers. CABLE HIGHLIGHTS: Note that Epix is unrated by Nielsen, so we don’t have ratings for GET SHORTY. The dragon-like GAME OF THRONES set another record, up an incredible 0.38 from last week to 4.98–and that’s with 2 more episodes to come this season. With that lead-in, BALLERS rose 0.09 to 1.21, INSECURE was up 0.06 to 0.66 (both those shows were just renewed), and LAST WEEK TONIGHT climbed 0.11 to 0.82. Adult Swim’s RICK & MORTY also continues to be huge, up 0.11 to 1.37, with DECKER: MINDWIPE up 0.07 to 0.48, and APOLLO GAUNTLET up 0.08 to 0.39. Starz’s POWER gained 0.03 to 0.78. The season finale of TNT’s CLAWS rose 0.05 to 0.56. However, FX’s THE STRAIN fell 0.07 to 0.36. On Showtime, RAY DONOVAN had a 0.05 bump to 0.29, and the season finale of I’M DYING UP HERE was up 0.03 to 0.07… but TWIN PEAKS fell off the chart, down 0.02 to 0.06/253K. MTV’s TEEN WOLF eased 0.02 to 0.21. Hallmark’s CHESAPEAKE SHORES lost 0.02 to 0.22. Unscripted was led by ESPN’s MLB game at 0.69. 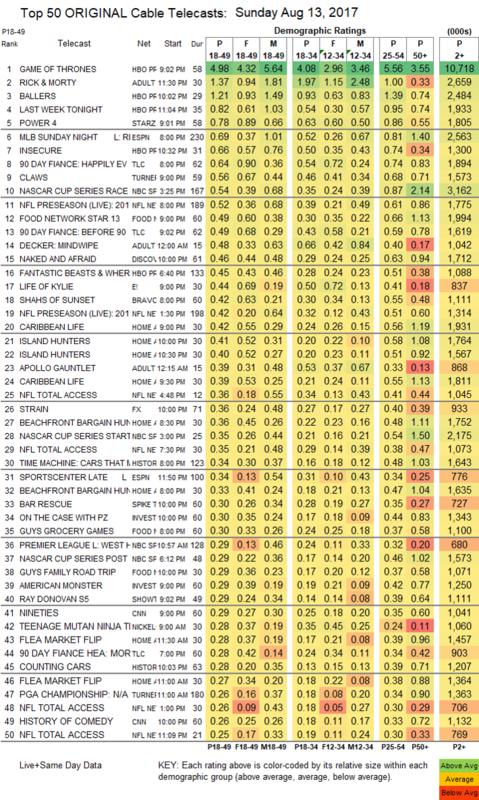 On TLC, 90 DAY FIANCE jumped 0.12 to 0.64, with the AFTER-SHOW up 0.08 to 0.49, and SPOUSE HOUSE steady at 0.23. NBC Sports Net’s NASCAR race was at 0.54. NFL Network’s preseason game was at 0.52. 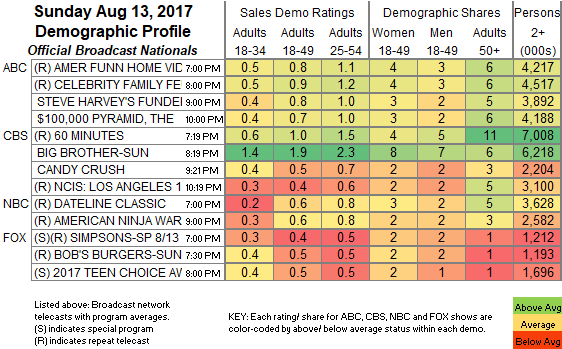 On Food Network, FOOD NETWORK STAR ticked up to 0.49, with lead-in GUY’S GROCERY GAMES at 0.30, and lead-out GUY’S FAMILY ROAD TRIP at 0.29. Discovery’s NAKED & AFRAID slipped 0.02 to 0.46. On E!, LIFE OF KYLIE was at 0.44 after last week’s premiere 0.51/0.49, and FAMOUSLY SINGLE was down 0.04 to 0.21. Bravo’s SHAHS OF SUNSET dropped 0.04 to 0.42. HGTV’s line-up was led by CARIBBEAN LIFE at 0.42/0.39, compared to last week’s 0.38/0.35. History’s CARS THAT MADE AMERICA was at 0.34. Spike’s BAR RESCUE rose 0.03 to 0.30. On ID, ON THE CASE shed 0.04 to 0.30, and AMERICAN MONSTER was down 0.05 to 0.29.